Physics Buzz: First Ever "Flat Atom"
Scientists have discovered an exotic "flat atom", artificially created by an electrical current. 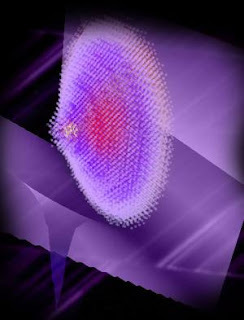 The exotic atom is the world's first quantum state-manipulable atom. Manipulable atoms, or atoms capable of containing multiple quantum states, are essential to the development of ultra fast quantum computers. Researchers had previously been unable to control how electrons occupy quantum states. But the flat atom allows scientists to keep track of the electron inside it, and consequently control the quantum-state using an electrical field. The breakthrough happened like scientific breakthroughs often do, accidentally. While experimenting with impurities in nano-transistors, scientists stumbled across a mysterious atom that formed a molecule with an arsenic atom by sharing an electron, stretched across both ends. The computerized model above conveys the flat, saucer-like appearance of the atom. The dots in the center represent bonding locations for a single electron, while the yellow dots seen on the upper rim are quantum state bonding locations. Perhaps its most striking feature, the exotic atom is completely manmade-its flat surface is contrived when an electrical current is applied across the transistor. Now how the heck did THAT happen? The idea of an atom being truly flat makes NO sense at all. A flat molecule, that makes sense. A flat atom, none at all. I agree with you. In those dimensions it would regester like a wave, though, A very intense one. Can not comprehend how the mass fluxuates. The interior structure must be hihgly unstable. Must use a lot of energy to stabelize one. If they think the impurities are bad at that level; must be a hugh problem when pico tech. is in play.